This past weekend, CBS 60 Minutes did a segment on the F-35 fighter program. The basic facts are these: the program is seven years behind schedule and $163 billion over budget. Yes, you read that right: Not $163 million, but $163 billion. The lead contractor, Lockheed Martin, is essentially unapologetic about the delays and cost overruns. Why should they be? The general in charge of the F-35 acquisition program said we’re going to buy thousands of the plane over the next two decades. Talk about rewarding failure! The F-35, given the amount of money thrown at it, doubtless has some improvements over planes such as the F-15 and F-18. But at a price tag of at least $400 billion to purchase the F-35, and $1.45 trillion over the life of the program to operate and maintain them, it has simply become far too prohibitive for the United States to afford, especially in a climate of fiscal austerity. Based on its track record, it’s probably safe to say that the F-35 will soon be a decade behind schedule and $200 billion over budget, even as it’s increasingly rendered irrelevant by improvements in drone technologies. So why are we buying it? Simply because the program is too big to fail. The Air Force, Navy, and Marines are all counting on it. Meanwhile, Lockheed Martin has distributed its subcontractors across the USA, making it exceedingly difficult for Congress to cut the program without hurting jobs in virtually every Congressional district. Indeed, in an awesome display of chutzpah, you can go to the Lockheed Martin website to see how much your state is involved in building the F-35. Clicking on the “economic impact map,” I see that for the State of Pennsylvania, for example, the F-35 creates 759 jobs and an economic impact of nearly $51 million. For the DoD, the F-35 may have ridden off the rails, but for Lockheed Martin the F-35 will continue to soar into the stratosphere as a major money-maker for decades to come. In the battle between DoD program managers and Lockheed Martin, the winner and “top gun” is as obvious as it is depressing. Score another victory for Lockheed Martin! But please avert your eyes as America itself goes down in flames. Update 2: For military/contractor perspectives, check out this video, which includes testimony by test pilots that is generally favorable to the F-35 program (at least from a technical sense). Update 5: I’ve worked on two Air Force software programs. Both were overly complex and plagued with coding problems that drove up costs and extended schedules while degrading performance. The software on the F-35 is yet another example of this, as this report indicates. The F-35 continues to slip in schedule as costs rise due to software flaws, even as reports emerge that the software is vulnerable to hacking. In trying for leading edge abilities, the contractor has found the bleeding edge, as they say in the military, but what is being bled is the American taxpayer. Update 6: More problems for the F-35, including oil leaks and one plane bursting into fire as it was taking off, are leading to more countries questioning their commitment to the plane. For a program so deep into testing and initial production, such problems are worrisome indeed. “Even if the mainstream U.S. media has been late in coming to the story, the largest defense program in U.S. history is facing two critical events this coming week. “As major British media has been reporting for some time, the F-35 Joint Strike Fighter may be facing a major international marketing embarrassment: It has failed to show up for two of three scheduled (and much ballyhooed) public demonstrations in the United Kingdom. Now, it may miss the main event, a flying demonstration before the world’s aviation community at the Farnborough International Airshow, starting Monday. You see, the F-35 is grounded-again. An engine blew up on take-off at Eglin Air Force Base on June 23 and reportedly burned up much of the plane’s flammable, plastic composite rear fuselage and tail. No F-35s are flying until inspectors know what the problem is and can say it’s safe to fly-at least in the very limited regimes the F-35 has been cleared for. Moreover, even if the F-35 is released to participate at Farnborough, there may be a new problem: weather predictions for next week in England are not good, and the F-35 has real issues flying near thunder- and rainstorms; it even has problems with wet runways. “Stuck at home or coddled in UK hangars, the timing could not be worse for F-35 advocates. This Tuesday, the Defense Subcommittee of the Senate Appropriations Committee (SAC-D) will mark up its 2015 Defense Appropriations bill, and more than the usual routine approval of the Pentagon’s F-35 budget request is at stake. As pointed out in two timely commentaries (one by the Center for International Policy’s William Hartung and a second by Taxpayers for Common Sense’s Ryan Alexander), the House Appropriations Committee larded onto the already gigantic $8.3 billion request by adding four unrequested F-35s, costing an extra $479 million. “The four added planes are clearly at risk given the F-35’s self-embarrassment at Eglin, surely inspiring the F-35 talking points Lockheed is planting on the Members of the SAC-D well beyond their usual spinmeister fantasies on cost and performance. Worse, there could-at least theoretically-arise a critic of the F-35 in the membership of the SAC-D who might try to take real action on the F-35, beyond the rhetorical hyperbole that critics like Senator John McCain (R-AZ) have been hurling at the F-35. Imagine the shock and awe if some Member were to offer a meaningful amendment requiring the F-35 to be tested-actually imposing “fly-before-buy”-before a few hundred more mistake-laden jets are produced. “Not to worry: the F-35 defenders are rushing to the rescue. Beyond whatever election year financing promises major F-35 contractors Lockheed-Martin, Northrop-Grumman, and Pratt & Whitney may be distributing to keep the program on track, Secretary of Defense Chuck Hagel has just completed a baby-kissing exercise for the airplane. Travelling to Eglin Air Force Base where that F-35 destroyed itself, Hagel declared“This aircraft is the future of fighter aircraft for all our services,” thereby removing any notions that his junket might have some useful purpose other than showing fealty to the beleaguered F-35 program. Any expectation that he went to Eglin to exercise oversight of the F-35’s recurring embarrassments, as one might expect from a functioning Secretary of Defense, has been thoroughly excised. That leaves it up to the Defense Subcommittee of the Senate Appropriations Committee. “The SAC-D has many important defense spending decisions to make. None will be a better test of whether the committee is willing to conform DOD program ambitions to Pentagon budget realities than this point in the endless F-35 drama. Of course, the easy road beckons; defense business-as-usual will be happy to shower the Members with handsome signs of approval, material and otherwise. “Unfortunately, more of the same simply accelerates the decay of our defenses at ever-higher expense. 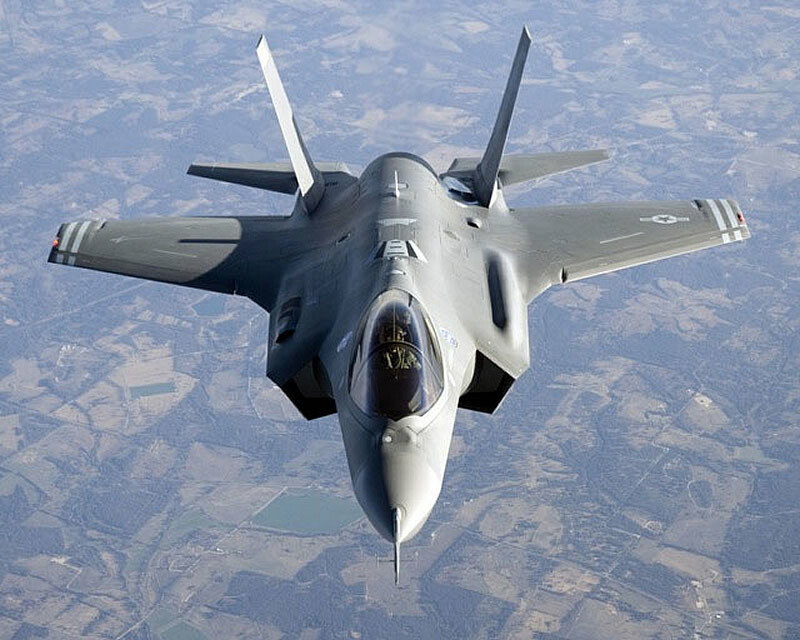 Update 8 (9/8/2014): Professor Mark Clodfelter in Air & Space Power Journal notes that the U.S. Air Force today is “purchasing far more remotely piloted than manned aircraft,” making it “remote” that the service will buy 1,763 F-35s at “flyaway costs of roughly $185 million each.” Meanwhile, the Navy version of the F-35 now exceeds $200 million in “flyaway cost,” with the Marines’ short takeoff and vertical landing variant (the F-35B) approaching $300 million per plane. And these per-unit costs are only due to rise as various countries buy fewer planes than currently projected. I can still recall being on active duty twenty years ago when the Joint Strike Fighter, progenitor to the F-35, was sold as a “low-cost” (at about $35-50 million per plane) multi-role combat jet in the tradition of the F-16. Since then, “low-cost” has become high-cost as the F-35 program spun wildly out of control. Yet despite the fact that the F-35 is the equivalent to a derailing and runaway train, the passengers on board remain captives to it, with some of them smiling all the while. Update 9 (11/7/2014): The AF is now claiming that A-10s need to be eliminated to free up maintenance staff for the F-35. If the venerable A-10s are not mothballed, initial operational capability (IOC) for the F-35 will be delayed, according to Lt Gen Bogdan. The AF also knows that Congress as well as soldiers love the A-10. Chances are that the A-10 will be preserved by Congress, which gives the AF the perfect excuse when IOC for the F-35 is delayed. See, the AF will say — We told you we needed those A-10 maintainers for the F-35. That’s the reason why the schedule has slipped yet again. It’s your fault, not ours. Perhaps the AF believes this is a clever gambit, but what’s being sacrificed (along with credibility) is combat effectiveness. And that may prove a deadly price for our troops to pay. Update 10 (3/17/2015): In this video, Pierre Sprey, the designer of the F-16 Fighting Falcon, explains why the F-35 is such a “Kluge,” an inherently terrible airplane, as he puts it, an overpriced and ineffective multi-role fighter/bomber that neither fights well nor bombs well. Originally slated to cost $233 billion, the Pentagon’s F-35 Joint Strike Fighterprogram could end up being costing more than $1.5 trillion. Which might not be so bad if the super-sophisticated next-generation jet fighter lives up to its hype. Arecent report from the Defense Department’s Director of Operational Test and Evaluation paints a pretty damning picture of the plane’s already well documented problems. The report makes for some pretty dense reading, but the Project on Government Oversight, a watchdog group that’s long criticized the F-35 program, has boiled down the major issues. Update 12 (4/28/15): More trouble for the F-35, this time involving its engines. According to Reuters, “The Pentagon’s internal watchdog on Monday said it found 61 violations of quality management rules and policies during an inspection of Pratt & Whitney’s work on the F-35 fighter jet engine and warned the problems could lead to further cost increases and schedule delays on the biggest U.S. arms program.” Further cost increases and schedule delays — where have we heard that before? “Pratt and the Pentagon are still correcting a design problem with the high-performance F135 engine that grounded the F-35 fleet last year, but that was not due to manufacturing issues. However, quality issues have grounded the fleet in the past. Unreliable engines — nothing to worry about. Right? Update 13 (7/29/15): Not surprisingly, given its design flaws, the F-35 is distinctly inferior to the F-15, F-16, and F-18 in dogfighting capability. Even worse, its cockpit design seriously restricts a pilot’s ability to “Check Six” (to look behind, often the most likely sector from which an enemy plane will attack). For more on this, check out this link: http://www.pogo.org/our-work/straus-military-reform-project/weapons/2015/leaked-f-35-report-confirms-deficiencies.html. Given its design flaws, which stem from compromises made at the very beginning of the program, the F-35 is not a “next generation” fighter — it’s a lost generation, a step backwards, and a very expensive one at that. The Pentagon released a report today requesting Congressional authorization for 500 gold-plated F-35 fighter planes. The F-35 Lightning II is a fifth-generation multirole stealth fighter intended to replace numerous aging aircraft, including the A-10 Thunderbolt II and the F-16 Fighting Falcon. The F-35 program has been fraught with problems, including numerous delays, cost overruns, and failure to deliver on promised operational performance. The new variant, dubbed the F-35G, is proposed as an upgrade over existing F-35 models. In addition to 24K gold plating encasing its exterior, its cockpit is trimmed with wood grain paneling harvested from the endangered African blackwood tree and leather upholstery from the hide of the northern white rhinoceros. Its GAU-12/A 25mm rotary cannon is able to fire solid platinum rounds at a rate of 3300 per minute. Each round is handcrafted by a Swiss jeweler. Each F-35G unit is projected to cost 8.2 billion dollars, approximately twice the average annual GDP of some of the countries it is expected to bomb. The total cost, including development, procurement, operation, and sustainment, will top $15 trillion over the life of the program. While most on Capitol Hill are interested in fulfilling the Pentagon’s request, there is heated debate on how best to pay for it. The White House was quick to dismiss Ryan’s proposal. “Also, President Obama is not very good at math,” he added. While most on Capitol Hill are supportive, some naysayers continue to offer criticism. Sen. John McCain (R-AZ) has remained vocal in his staunch opposition to the F-35 program. “There is nothing a gold-plated F-35 can do in close air support that can’t be done better by a silver-plated A-10,” he opined. It also remains to be seen if the F-35G’s combat performance will be able to deliver on the program’s promises. At present, the added weight from the gold plating has prevented the F-35G from achieving flight. Its first test was a disaster, as the prototype F-35G rolled straight through the end of the test runway and careened into oncoming traffic on a nearby highway, resulting in 12 fatalities. “Slight tweaks to the design are still required, however it is clear that the F-35G is the future of United States combat aviation,” the report concluded. The operational suitability of the F-35 fleet remains below requirements and is dependent on work-arounds that would not meet Service expectations in combat situations (emphasis added). Over the previous year, most suitability metrics have remained nearly the same, or have moved only within narrow bands which are insufficient to characterize a change in performance. Overall fleet-wide monthly availability rates remain around 50 percent, a condition that has existed with no significant improvement since October 2014, despite the increasing number of new aircraft. One notable trend is an increase in the percentage of the fleet that cannot fly while awaiting replacement parts – indicated by the Not Mission Capable due to Supply rate.